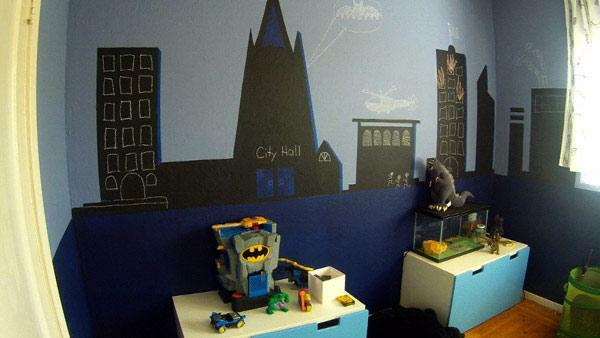 Lisa Quinn transforms a 6-year-old boy's room into a playful space -- setting a stage for him to create amazing artwork on his walls. by Fabian Scrivani This week on the show, we tackled a boy's room and incorporated a fun wall treatment while bringing organization. Children's rooms are the ultimate in creative expression and allow designers to run wild and try out new ideas. Crazy color combos and themes can often feel too overpowering, and frankly are over done, so we decided to give Owen the freedom to design his own world within his room through chalkboard wall paint. We prefaced with concept of a comic book idea and letting Owen be the artist. Then we set the stage with a simple city scene he can embellish. Chalkboard paint is a great option because it goes on just as easy as regular paint and can even be mixed with color. A two tone blue effect with the darker below and the lighter above act as a visual divider. Owen can draw up an action scene either during the day or night. There was awesome bedding at IKEA we knew would be perfect, but not having twin sizes in stock put a bit of a damper on our plan, that is until Lisa whipped out her trusty sewing machine and told me to make it work! We ended up getting a full/queen size and I ran a simple hem along one side to make it work. The curtains above the bed were the perfect fit because of the tree motif that added a lively touch. The rug in the space grounds the bed and acts like a grassy park where his dinosaurs can graze. Two extra deep toy boxes will hold all his toys, pleasing mom, and they can also be used as stools to sit on when drawing on the walls. We re-used the existing desk and added googely eyes on the drawer fronts above the knobs for playful effect. Lisa Quinn designed a room for Owen, 6, that will hopefully spark his imagination. Check out the before and after photos of the makeover.